Aren’t the illustrations with Sakura flying the best ones? I just love them xD Keep those feathers coming! 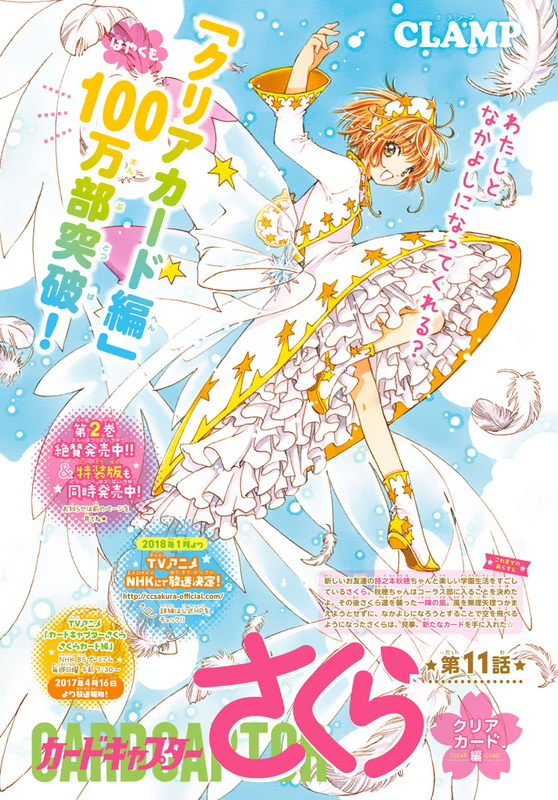 Also, it’s worth mentioned that the title page says that the total sales for Clear Card arc have surpassed the 1 million milestone, which is huge. And we are talking about the sales of volume 1, only. So nothing was explaining regarding the bow that made Sakura fly in the previous chapter. We all assumed that it could have been another card, but they only talk about RECORD, making it look like that was the only card that was secured. So what the hell was that bow? Was it something that RECORD recorded? But we all saw how Sakura was still in mid-air when she secured the card…. weird. I bet we all saw the paralels of RECORD and The Mirror, except that RECORD seems to be able to record anything and not just make a copy of a human being? Sakura mentioned again that she was just thinking how it would be nice if she would capture/record a moment. Does she know her smartphone can do that? Either that can will be very important at one point ahead, in which something will be recorded, or these cards are being taylored specifically to meet Sakura’s needs. That latter theory so far only applies to RECORD. She doesn’t seem to have been in need of any of the other cards… or has she? So WHAT ARE THE ODDS THAT AKIHO LIVES IN ERIOL’S FORMER HOUSE? This is getting so very suspicious. Surely this isn’t by chance and I think it will play a big role in the story. Some people have pointed out that Eriol’s house was destroyed in the second CCS movie, so Ohkawa will have to think of a way to mend that for the upcoming TV Anime series. Sakura then sort of asks Syaoran out on a date, and it’s the cutest scene! Way to go girl, playing the feminist and asking the boy out instead of waiting for his move. But Syaoran needs to step up his game now, be a gentleman and ask her out the next time. This relationship is too “warm” xD I feel like CLAMP are building up to this moment where all SyaoSaku fans have been waiting for. It will come, guys, hang in there! So Sakura and Tomoyo go visit Akiho’s house and CLAMP introduces us to Akiho’s guardian just like that. It’s not anyone we’ve known, it’s a brand new character and he is beautiful! Did CLAMP try to make him English? European at least. His name is Yuna D. Kaito, which means he is completly unrelated by blood to Akiho (unless that’s an alias — you never know with CLAMP!) Isn’t Yuna a feminine name? Or is it gender-free? And Yuna is written in Katakana… Also, the “D.” in his name obviously made me think about Fye. I wonder if Yuna could be related to this dimension’s Fye…. Being a male CLAMP character, Yuna is obviously a good cook, and the girls are amazed by his homemade cake. Akiho looks worried/concerned/sad when Yuna says that making delicious food for Akiho is nothing but his job, and Sakura notices it too. Only 26 pages this month, I think it’s because we got 37 pages last month xD Assuming this is the second chapter of volume 3, this would mean that we have 63 pages for volume 3 so far. CLAMP hasn’t missed a beat for a single color illustration for this series. The colors and composition are always superb! So what the hell was that bow? Was it something that RECORD recorded? But we all saw how Sakura was still in mid-air when she secured the card…. weird. I bet we all saw the paralels of RECORD and The Mirror, except that RECORD seems to be able to record anything and not just make a copy of a human being? I think it’s weird that we didn’t find out anything about the bow butterfly this chapter, too. That and RECORD this chapter revived my biggest complaint about the Clear Card arc so far — that Sakura doesn’t really seem to care that much that the Sakura Cards are missing. You would think that, given the bow’s resemblance to The Fly and RECORD’s resemblance to The Mirror, she would be reminded of them for a moment, right? And those were two of the most important cards to her. It makes me wonder if Sakura’s lack of concern is going to become a plot point down the line. It is significant that Akiho is living in Eriol’s house, but she herself seems clueless about what it means. My impression from Akiho is that regardless of what’s up with the Mysterious Cloaked Figure, the Clear Cards, or even the search for the mysterious book, she’s an innocent party (who might be under manipulation by someone else with less pure motives). Yeah, good point. I think that in the TV Series, with more screentime, this will be better addressed. I’m surprised this is how it turned out, but what with the prologue OAD copying Vol. 12 and all, I think Ohkawa and Morio Asaka really are going to ignore the second movie for the sake of ensuring continuity in the new TV series. You think? I think they will find a way to mend everything while still considering movie 2. Yes, me too. Or like Eriol, which seemed evil reincarnated but in the end was only doing what he was doing to help Sakura. Akiho was going to say something else! But Sakura cut her off…. At least we need to give some credit to Sakura for quick thinking about an excuse to get rid of Akiho. Back in the day she would probably think “What do I do? Akiho-chan is here” and now she’s coming up with lies to get what she needs. Sasuga, Sakura-chan! My thoughts exactly. It feels like unrequited love so far. Woh, I’m surprised they didn’t talk about the bow even for a second…… That’s weird…. A new love story made in Clamp ! Can’t wait to see more ! There are small things that have differed between the manga and the anime, it might just be the case here, again. I somehow think that Ohkawa will try as best as possible to merge both together, but I do think that she will keep “The Hope”, for example. I don’t think she will get rid of it. That’s a very good comparison you made there between Akiho and Kaito and Alice in Wonderland! I read down here that you think the bow was created by the staff, it could be it ! This is the staff of dreams after all, and I always forget that Sakura is now even powerful than Clow ! We all know how much Clamp love Alice, so I won’t be surprised if the references are intentional ! We’ll see what is Akiho’s favorite book……. I thought the same about Alice in Wonderland. Also Momo is the rabbit, it even has a mini clock. About last episode’s bow, I think it was Siege and and Gale working together. Siege doing the bow shape which ride on Gale’s wind. At least Sakura is thinking of both cards before the bow appear. Finally, we see Akiho’s companion, Yuna D Kaito… which is the first name? Do it works like Ryuu F Kazuhiko or like Fye D Flowright? I just happen to be reading Tsubasa’s 21st tankoubon, those who have D in their name one class one magician in the Selece world. He certainly has male hips, but I’m not sure about the shoulder. Female shoulder would mean he’s a genderless creature, like Yugito/Yue and Nataku/Ruby Moon… Maybe he has bat wings? He could be Feiwong’s underling? I don’t think the bow is Siege and Gale working together, but rather a new card that’s different from Record, because Sakura said “it moves around like a piece of cloth” on page 22 and we could see the tail end of the mysterious bow before and after Syaoran attacked it, and it only showed itself to Sakura after she asked if they could be friends. If it was Siege and Gale working together she never would have thought “I can’t catch it against its will” or asked if they could be friends. Hahaha that would be a good plot device, but the house would have to rebuild itself on another location since where it was before there is now an amusement park. Regarding the bow, looking better at the chapter, I think it’s none of the cards who have done it. I think it’s the staff itself! She thinks about SIEGE and GALE, but then she says “no”, like she knows it’s no good. Then, she thinks to the staff and then the bow appears. After that, she thanks the staff so I really think that there is no card here. Hence why she is still in mid-air when she captures RECORD. I also think Yuna can be a creation like Yue and Ruby Moon. It really feels like Akiho is a Card Captor herself xD The paralels are too much and I’m sure wants us to think that! Clow’s book no longer exist, but the news may not have made the front page of Witch Weekly. Maybe Akiho is looking for a book that no longer exist. We know the Lee family knows it turned into Sakura’s book, but looking Xiaolang’s attitude at first, they don’t seem to share their knowledge with any and everyone. And since she just happen to live in Clow’s house, she’s probably looking for a book related to Clow. If she wanted Sakura’s book, she would have moved in her street or something. Akiho could be a Card Captor, but she didn’t made any move to catch Action while she was in the same classroom as Sakura. Either she preferred to leave the card to Sakura over blowing her cover, or she’s so new to it and can’t do much yet. But if it was the staff then why is it on page 21 and 23 we can see part of the bow (look very carefully at the “wind”)? It would make absolutely no sense for the staff to be doing it since we already saw part of the bow flying around above their heads right before Sakura thinks about Siege and Gale and before she said “can we be friends”. But it’s definitely not the “fuwa” the wings make on page 21 and 23 of chapter 11. I think it was either the staff or Sakura’s own magic. There is a little icy thing in the middle of it, which makes me think it comes from the staff, much like the wizards use wands to conjure magic in Harry Potter. I have been wondering yesterday, what if these new cards are one of Fay’s youth magic projects? We know he was the most powerful of his world, even with the tattoo. I don’t think Fay is the cloaked one from the dream, that person is too short. Akiho is more likely, at least her shape fits better. But whoever the cloaked one is, it doesn’t have to be the creator of the cards. So true! I still wonder why he doesn’t use more magic in TWC (which brings the thing to another post I put where I wonder why Fai doesn’t use his magic to make Sakura and Syaoran talk and send gifts to each other directly, we all saw him using his runic spells to open a communication window with Yuuko in Infinity). In your supposition of “Fai’s youth magic project” bout the cards then it’s just like he is behind the scene staying still in Celes? Still there’s Syaoran attitude to understand, like he knows what is happening. Like someone told him or he saw it. So my suppositions is more related to Li family, or better, to Clow descendants… english side maybe this time. Could Akiho’s family be that? In which case I don’t see a relation with Fai, instead, unless Clamp are gonna build the more complex family tree ever xD . Or maybe she did business with the Hunter Fuuma to acquire the book. The cards are a mix of Western and Eastern magic, the Lee family would only use the Eastern kind and the Read, the Western kind… And if the Lees and the Reads aren’t working together, there are little chance they would come up with a set of cards. And these are indeed cards. They aren’t natural phenomenons, they could be Sakura’s unconscious creation, as she’s already familiar with cards. If not, it has to be a half Chinese, half English magician, or a descendant of one. Maybe Clow had siblings? Maybe he had a close Read cousin with who he shared is knowledge? Anyway, the Clear Card are linked to Xiaolang and Ahiko’s coming to Japan. Akiho who was in Hong Kong before, just like Xiaolang. Until now I found a sort of sense thinking that the Bow was the wingy part of the Record card itself, and Sakura tamed it in order to catch the rest of the card, like it agreed to collaborate to catch itself. But then when she showed it to Yue and Kero there was only the recording skill (creepily similar to the creation of a clone), if there’s a wingy part of it she should be able also to fly as much as she wants. So yeah, we should kinda take in account that sometimes Sakura and her new staff can do unpredictable things like taming spiritual entities around to reach their goal. Not impossible since Sakura should be naturally able to communicate also with non animated objects : see Tsubasa-> a child Sakura talking with plants, or when she talks with that Tornado in the isle world, and her favourite one to communicate with is water as she states. Now dunno if there’s a relation but water is kinda her “signature”, so I’m wondering if also Ice has the same role for her. Could be, we really need some explanation. Ohkawa, please! my first thought was that she’s after the clow/sakura book. and my other first thought was that momo and yuna D kaito are the same as yue and kero. and is that a magic circle i spied on yunas watch??? hmmm… and akiho is somewhat paralleling sakura. they are strangely similar. coincidence i think not! another thought is that she’s related to the li family or clows english family- have we ever learnt about the english side yet? im leaning towards the english side cause of the alice in wonderland parallels. i think someone commented about it too. Only possible connection to Clow’s Read family would be Feiwong Read, although nothing is confirmed as of now. He could be a fan who stole the name for all we know. random thought while on my late lunch break- could the cards be something sakura unconsciously created? like she said she was only talking about recording and then the RECORD card shows up. didnt they do something like this in the animation and second movie where her strong feelings for syaoran created the hope card? not sure how the other cards tie in with her… like i said random thought! but it would tie in and expand the ability she developed in the last episode of the anime. It does seem to be the case for RECORD, but we don’t have concrete evidence yet that it’s the same case for the other cards she already has.